Mare is the southernmost Loyalty Island, located an overnight sail from Noumea. It is a small island with only a few possible anchorages and these require some care in your approach as there are numerous coral heads, often just below the surface. It is an interesting little island and well worth a visit if cruising the Loyalty Islands. Foreign yachts must clear in at Noumea before sailing to Mare. 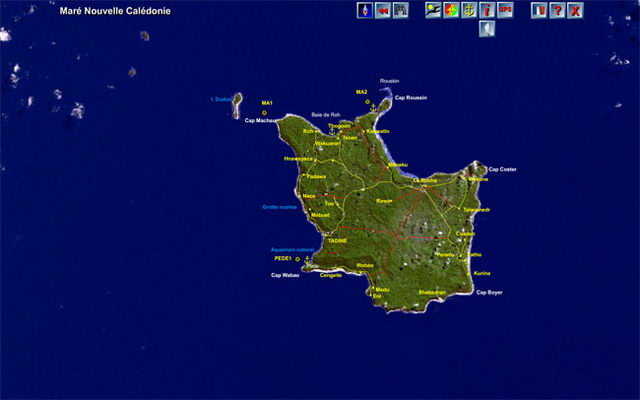 The Cruising Guide to New Caledonia has high resolution photocharts and sailing directions for every anchorage in Mare. You will see exactly where to anchor with precise sailing directions, GPS coordinates, depths, reefs, nav aids and lights, and even nearby treks ashore, shops and fuel service stations. Navigation chart of Mare in the Loyalty Islands from the Rocket Cruising Guide to New Caledonia. You'll need to rent a car to see the more interesting sites in Mare. In the companion travel guide you will find where to rent a car, available tours, interesting places to visit, cultural requirements, restaurants and accommodations.